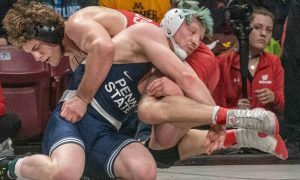 Heading into Friday’s match with Ohio State, Bo Nickal was seemingly in a dead heat with teammate Jason Nolf for the 2019 Hodge Trophy. Bo jumped way out in front of the race though when he pinned second-ranked, then-undefeated Kollin Moore (Ohio State) in only 1:38. He was able to put Moore in danger after countering a single leg attempt and then locking up a cradle. The fall was a part of a 28-9 rout of sixth-ranked Ohio State, by unbeaten Penn State. It was also the 13th pin in 19 matches this season for Nickal. He has now earned bonus points in 18 of those 19 matches. The victory over Moore gives him a seventh win this season over wrestlers that are currently ranked in the top 20. During his career in State College, Bo has accumulated 54 falls, which puts him only two behind Nolf on the school’s all-time list. Some questioned whether Nickal would be able to handle the move from 184 to 197 lbs during the offseason. Bo’s gaudy pin totals, undefeated record, and his ability to manhandle a competitor like Moore have erased any of those concerns. For the remainder of the season, Nickal’s focus will be on capturing his third Big Ten and NCAA Championship. After three-plus years at Penn State, Bo’s career record now sits at 109-3.